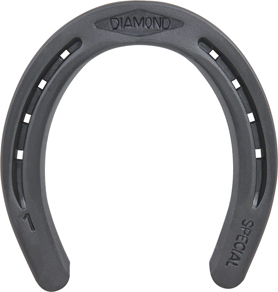 The Diamond Special Plain has a rounder shape and slightly wider web than the Diamond Classic to give it a “fuller fit.” The precision nail hole pattern and easy hot or cold shaping makes this an ideal shoe for a variety of situations. The shoe is 1/4” thick. Shoes are symmetrical. Punched for City or Slim blade nails.